Violence against civilians is devastating communities and preventing access to lifesaving health care in Jonglei. A consultation in the outpatient department of MSF's clinic in Pibor. Jonglei has been the epicentre of violence in South Sudan in the past 18 months. Over the period covered by this report, from January 2011 to September 2012, just under half of reported “conflict incidents” and over half of reported “conflict-related” deaths and displacements in South Sudan had taken place in Jonglei.1 Whilst violence has continued throughout the rainy season, the approaching dry season makes movement throughout the state possible again and is likely to bring with it renewed insecurity. While Jonglei has a long history of intercommunal cattle-raiding, since 2009 Doctors Without Borders/Médecins Sans Frontières (MSF) has drawn attention to the changing nature of the attacks.2 While appropriating cattle used to be the main aim of the attacks, nowadays civilians are targeted, with women and children making up a large proportion of victims treated by MSF teams. In response to these attacks, the Government of South Sudan launched a disarmament campaign in March 2012 throughout the state. Aimed at bringing security and stability to Jonglei, the process led to widespread insecurity and localised displacement and was accompanied by abuses against the civilian population, including violence and sexual violence treated in MSF health facilities. 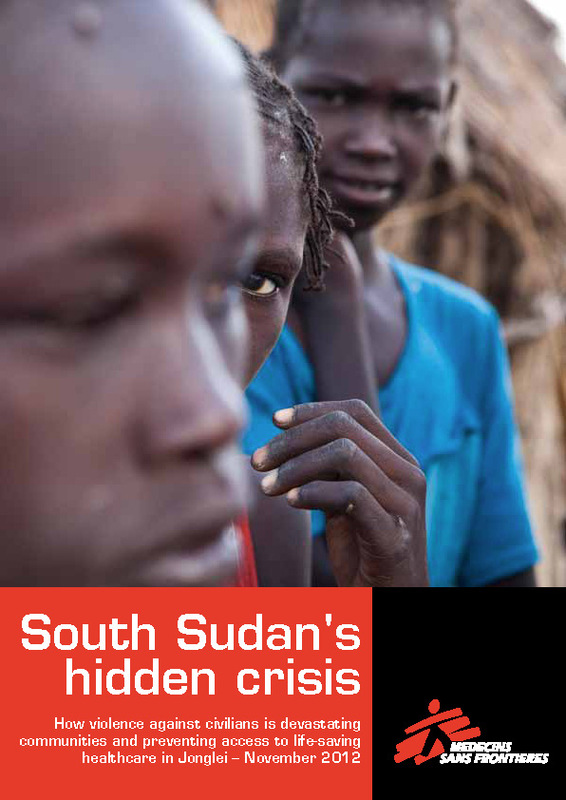 In August and September 2012, the resurgence of clashes between the South Sudan army, the Sudan People’s Liberation Army (SPLA) and a militia group in Jonglei resulted in renewed displacement and insecurity in the region, as well as the reduction or withdrawal of most aid groups, including MSF’s partial and temporary withdrawal from Pibor town and outlying areas. South Sudan has some of the world’s worst health and development indicators, with a life expectancy of 42 years3 and three-quarters of the population unable to access health care.4 There are very few health structures and qualified medical staff on the ground, as well as significant geographic barriers to accessing even the most basic health care. There are regular outbreaks of meningitis and measles and high rates of malaria, diarrhoea and malnutrition. 2011 to 2012 has seen the repeated looting, damage and destruction of medical facilities in Jonglei, including Pieri in August 2011, Pibor and Lekwongole in December 2011, Lekwongole in August 2012 and Gumuruk in September 2012. This disturbing trend of targeting medical facilities not only raises concerns about the extreme nature of the violence in the region, but also about the wider impact on access to health care for people already vulnerable as a result of violence. The insecurity and displacement in Jonglei have further exacerbated the low baseline for health care and contributed to the worsening of the population’s health. People have seen their infrastructure and assets destroyed, coping mechanisms lost and agricultural activity diminished. Repeated and prolonged displacements have increased the population’s risk of getting ill and insecurity has reduced the population’s ability to access health centres. As one of the main health care providers in Jonglei, MSF responded to the consequences of the violence and displacement in Lou Nuer and Murle areas, from its six health centres in Pibor (Pibor, Lekwongole, Gumuruk), Uror (Pieri and Yuai) and Nyirol (Lankien) counties. 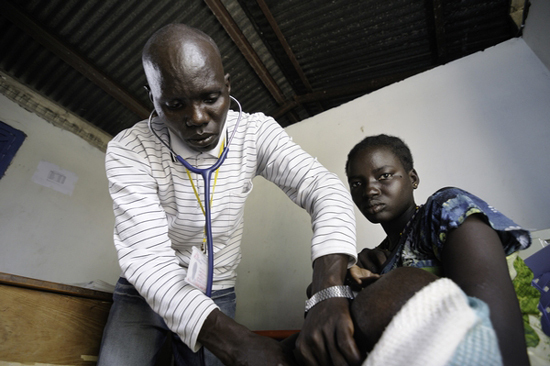 In 2011 and 2012, MSF has treated hundreds of wounded from violence and regularly responded to the urgent health and humanitarian needs of the population in Jonglei. Safety and access to health care—Today, Jonglei’s population is not safe from repeated violence, displacement, and looting. The approaching dry season brings with it the risk of an increase in violence. All actors must therefore use all their possible influence to ensure the population’s safety and ability to freely access urgently needed medical care and other essential services in Jonglei. Respect for health structures—MSF remains engaged in providing neutral and impartial medical care to the people of Jonglei. At the same time, all armed groups must respect the safety of patients and the neutrality of medical facilities and staff. All other international and national actors must take responsibility for countering the new and worrisome development of targeting health facilities. Emergency response capacity—The Government of South Sudan, the UN, donors and humanitarian organisations must take all steps, including in terms of political backing and funding, to ensure that there is adequate emergency response capacity. In addition, as a baseline, accessible health care should be made available throughout Jonglei. ?On the day of the attack, many people were killed and others were wounded. They set tukuls (huts) on fire and threw children in the fire. I collected the children to run away but, because I am old, I cannot run fast and they killed the children that were with me. I was running with three children; two were killed and one was wounded. As the attackers came, they hit me with the end of the Kalashnikov and stabbed me in the head and they tried to kill the children. If the child can run, they will shoot them with the gun; if they are small and cannot run, they will kill them with a knife. The baby that survived was beaten to the head. They picked her up and threw her on her head, so she has head trauma. She is better now. ?